This family mountain cabin displays Knotty Pine craftsmanship. Master bedroom on one side of the cabin with king bed, fireplace, TV, and jacuzzi tub, shower, and 2 sinks and walk in closet. Large Great room with the kitchen, living room, and dining room and Island with four stools.....all surrounded by knotty pine, high ceilings, big windows, and fireplace to the ceiling, 1/2 bath, and laundry room. All Granite counter tops, Travertine Baths w/granite, All wood flooring. Opposite end of the house has two bedrooms with queen beds and bath. Smart Big Screen TV/DVD and video player. We live in Hawaii I work for United Airlines my husband is an Engineer. Large back deck, open living, kitchen, dining area, great for entertaining, with high ceilings and large windows. Great property - will be back! We have stayed in Pinetop several times and this is my favorite cabin by far! Great layout and lighting. Loved the fireplace and amenities of the place. Nice and clean! Will definitely be back. Very beautiful spacious cabin, equipped with many extras, we went prepared due to our last stay at a different home didn’t have everything. This cabin felt like home away from home. You can just bring your luggage and groceries and enjoy your stay. Great cabin in a beautiful area. Almost everything was awesome. The cabin was well stocked and comfortable. It has high end fit and finish, provides all cookware, a gassed up grill, nice TV with all the streaming apps, and a nice electric fireplace in the living room (the one in the master bedroom did not work). Bed in the master bedroom was very comfortable, the one in the medium sized bedroom less so (did not try out the small bedroom bed or the sleeper sofa). The windows in the cabin are huge, so when it snows you get amazing almost 360 degree views of the snowfall - it is beautiful. A couple of minor annoyances: the thermostat is controlled remotely by the owner and was on the fritz - once the owner sets it to where you want it by contacting them, DO NOT touch the thermostat - we did and it jacked up the temp to an unbearable level, and I had to contact the owner again to lower it back down because I could not. As mentioned, I couldn't get the fireplace in the master bedroom to work - could be user error, not sure, but I did not see a pilot light. It would have been helpful if there were some instructional documents left for guests for operation of things (and warning about not operating things) like the fireplaces, thermostat, etc. The place could use a tea kettle too - ended up boiling water in a pot. Overall, the cabin is AMAZING and the only amenity that it perhaps lacks is a hot tub outside. GREAT STAY! WOULD COME AGAIN! Thank you for all the feedback we sure appreciate it. The thermostat had been controlled by the housekeeper and once you contacted me I immediately opened it up so you could set it where it was comfortable for your party. Sorry for any inconvenience that caused you. The fireplace pilot puts off a lot of heat in the summer and it just cooled down so that hadn’t been relit some of our guests are handy that way and either turn them off or relight them. It works perfectly tho we were just up there for a few days which is when we update and restock. In which another tea pot was bought. Thank you for choosing our cabin. We enjoyed the Pinetop home. The Pinetop home was comfortable, nicely decorated and perfectly situated near the golf course. The back patio was especially nice with a nice setting to enjoy with friends and family. 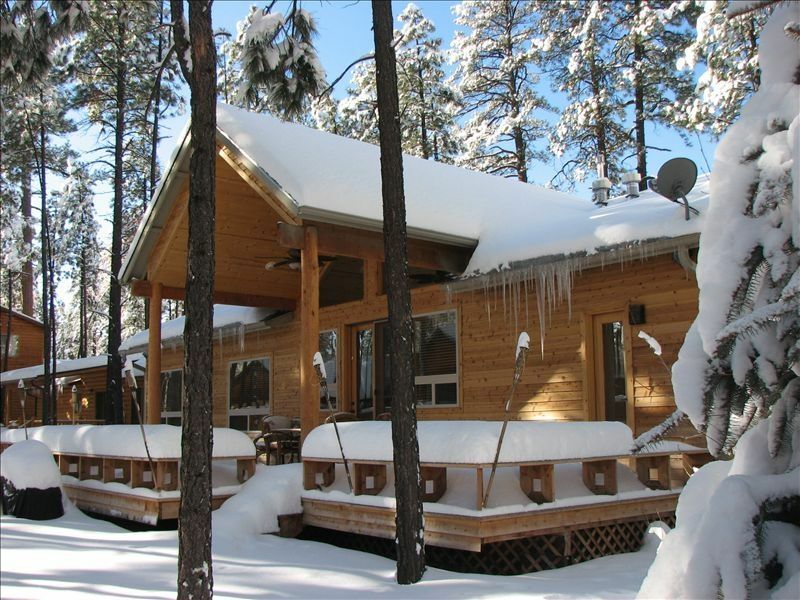 Come stay in our Five Star Mountain Cabin, Sit out on the huge back deck, while watching squirels, hummingbirds,and listening to the birds Quiet, peaceful, and relaxing, Take a drive up towards sunrise and look for Elk, We have great fishing spots.